Discover the fascinating world of the farm with animals (cow, pig, sheep…), a tractor and trailer… Includes 23 wooden pieces, 1 train with a set of 25 tracks and a box in the shape of a farm.Sold in a big suitcase with plastic handle. Welcome aboard, sailor! Outsmart your opponent and be the first to sink all of the opposing ships! 2 levels of difficulty (20-square beginner player grid / 64- square experienced player grid). 10 magnetic ships per person, to be placed on the grid. A grid (erasable) for recording the shots fired at the opposing side. Includes 4 grids sliding in the plastic cornes of the frame, 2 compartments, 20 magnets, 2 erasable grids, and 2 erasable pens sold in a shrinkwrapped box with a cardboard sleeve. wooden stool for SPLASH 2-IN-1 CONVERTIBLE DESK. 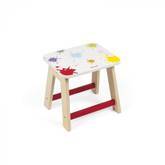 This very sturdy wooden stool will soon find its place in your child’s bedroom. 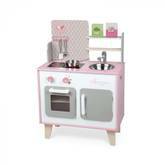 Its height is intended for toddlers, and enables them to set themselves up comfortably to draw. Its crossbars and legs are made of solid wood for maximum sturdiness and stability. It may also accompany the 2-in-1 Splash convertible desk (sold separately). Self-assembly. Closed color box. STORY EXPRESS SAFARI Let’s go! We’re off on a safari day to discover savannah animals! Includes 12 wooden pieces and 1 train with a set of 17 tracks, so total 33 pieces. Solid wood. Sold in a pretty suitcase with handle. All the creatures of the forest have lost their colours! 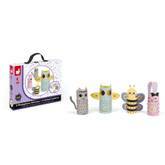 Help them to get them back by stamping scales, feathers or leaves using the stamps. 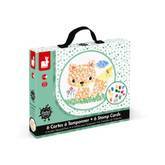 This kit contains 6 superb illustrations to stamp (owl, fish, fox, hedgehog, tree and butterfly) and 11 stamps of different shapes and colours. This activity is perfect for shape and colour recognition. 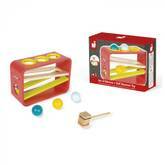 It helps stimulate fine motor skills and develop logic. Cards : 20 x 20 cm. Instructions leaflet in 7 languages (French, English, German, Dutch, Spanish, Italian and Russian). Breathe life into these 4 magnificent lanterns: rabbit, cat, butterfly and owl. Simply lift the different zones (such as the feathers of the owl or the hairs of the cat,), assemble the different parts of each animal and glue pretty sequins to make them shine. All that’s left to do then is place the lantern over a candle so that it sparkles with a thousand beams of light in the night (LED candle supplied with a battery CR2032). This activity is perfect for developing concentration and manual dexterity. Contents : 5 sheets (19,5 x 24,5 cm), 4 transparent sheets of different colors, 1 sheet of diamonds, 1 LED candle with ON/OFF button (battery included but packed separately). Rabbit : 6 x 6 x 18 cm. Instructions leaflet in 7 languages (French, English, German, Dutch, Spanish, Italian and Russian). A wooden metal xylophone: Plywood for the body, beech wood for the wheels, tea wood for the sticks. 8 Metal keys. Black rubber rings fixed on the wheels to make them silent when pulling the toy. 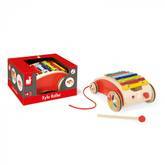 Diatonic musical scale 2-in-1 toy: Xylophone for budding young musicians and pull toy for bringing everywhere from the time of Baby’s first steps. Big fire station in wood on 3 levels, equipped with a manual elevator and a landing strip for the helicopter. 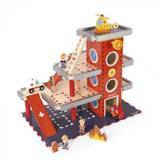 Sold with 10 wooden accessories: 2 cars, 1 helicopter, 1 ladder, 1 traffic lights, 1 fire hydrant, 1 fire and 3 firefighters. Delivered unassembled. Closed color box. Become the loveliest fairy of them all by making your own costume! Several accessories are included to decorate fairy wings, and to create a splendid crown of flowers, not to mention the vital magic wand for transforming your toad into Prince Charming. This activity is perfect for developing concentration and manual dexterity. Contents: 1 headband with 8 flowers, 1 wooden stick with a double-sided sticking flower and 3 ribbons, 1 string, 4 wings, 1 felt fastener system with 2 elastic straps, 3 pairs of plastic eyelets, 4 sheets of round foam mosaïc stickers (matt), 2 sheets of round foam mosaïc stickers (with glitters). Instructions leaflet in 7 languages (French, English, German, Dutch, Spanish, Italian and Russian). 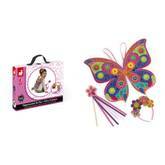 Crown of flowers : 12,5 x 7,5 x 14,5 cm, Magic wand : 7 x 24,5 cm, Fairy wings : 46 x 35 cm. With the Mandala, create and decorate dresses for 9 world princesses (printed but not cut). Showcase your work with the stand provided. Contents: 1 tube of glue, 130 colourful diamonds, 1 black felt tip pen, 6 colouring pens, 1 instruction booklet. Sold in a fully-printed cardboard case with fabric handle. Your next picnic is sure to be a success with this ultra portable picnic accessory carrying case. 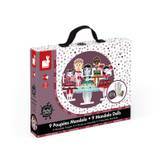 Includes several accessories (21 pieces) : 4 glasses, 4 plates, 4 little spoons, 4 forks, 4 knives and a fabric tablecloth. Wooden toy. Accessories made of wood and hamper in cardboard. 10 accessories: a syringe fitted with an inner spring, a reflex hammer, a bottle of disinfectant, a stethoscope, an otoscope equipped with a magnifying glass, a thermometer, a tongue depressor, a prescription pad (30 pages) with a paper pencil, a bandage roll. Accessories in solid wood. Delivered in a lovely red and black suitcase equipped with a metal zipper and 2 fabric handles. 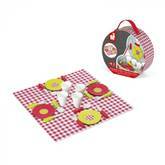 A vibrantly coloured multi-activity table with 4 different areas! – 3 stackable animals and a maze to develop dexterity, – a 4-wheel gear system for coordination, – 5 linking cubes to learn shapes and colours, – an abacus to develop concentration and motricity. Table height: 37 cm/14,5 in. Delivered not assembled. Large closed colour box with plastic handle. 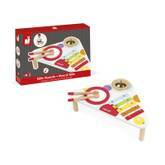 Prepare tasty little dishes for your friends, just like mom and dad, and become a Little Chef!!! The all-wood Happy Day Cooker includes a clock, spoons peg, metal sink, 2 rotating buttons with noise, a LED cooktop that makes sound (when you press on the red buttons once, you can turn on the lights of the induction hobs; when you press on the red buttons twice, you can hear the sound of boiling water. The light and sound turn off by themselves after 30 seconds or if you press a third time on the red buttons). 7 accessories included: 1 metal spoon, 1 metal frying pan, 1 metal colander, 1 potholder and 3 cardboard food boxes. Just like a real kitchen, it features two dials with sound effects to turn on the two induction cookers, an oven and a cupboard with magnetic doors. Height of the worktop : 50 cm: 19,7 in. Delivered not assembled. Closed colour box with plastic handle. 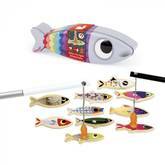 Fishing game composed of 10 funny and colourful sardines, supplied with 2 fishing rods in wood, with a hook in the shape of fish. Metal sardine shaped box. Wooden fish. A lovely heart box that will be well appreciated by little girls. 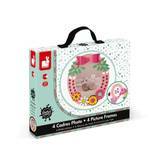 This box includes all the accessories to make beautiful little bracelets or necklaces for itself or its friends! 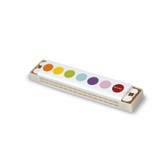 Includes a set of 250 wooden beads, 6 cotton strings, 6 sets of metal fasteners, 1 needle and a plastic needle threader. Sold in a lovely tin box with a heart shaped window on the lid showing the beads inside the box. A game of physical skill that will help your child develop manual dexterity while having fun. Baby will have fun using the hammer to strike the 3 balls and send them down the ramp to ring the bell. Wooden toy. Wood : Wood chaff and Teawood for the balls and the hammer. 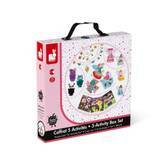 5 arts and crafts activities perfectly suited to developing concentration and manual skill: Shrink plastic: a complete kit to create 6 pieces of jewellery (2 bracelets, 1 necklace and 3 rings). Simply colour in the pre-cut melted plastic shapes by tracing the models, cook them in the oven and affix them to the chains to make pretty jewellery. 2 fairy garlands to decorate your bedroom: 8 pre-cut dolls to assemble and accessorise using the coloured diamonds. 3 cute animal pompoms to make using 3 balls of wool. 3 mosaic cards: numbered cards with glue-on foam mosaics of various shapes and colours. 3 cards to scratch using a wooden stylus to reveal various scenes from Cinderella and Rapunzel. Instructions leaflet in 7 languages (French, English, German, Dutch, Spanish, Italian and Russian). 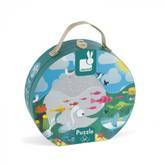 24-piece puzzle on the topic of the ocean, in a nice round suitcase easy to carry with its fabrics handle. Puzzle : 50 x 40 cm. Poster included. Janod Racing Board Game - Jungle! 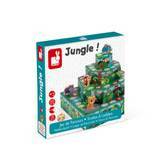 Rediscover the “snakes and ladders” game, redesigned as a “Jungle” version, played in a three-dimensional environment. Choose your favourite animal, throw the dice and climb the ladders! They will bring you to the top. But beware the waterfalls that will make you lose ground. May the best player win! Game composed of a cardboard game board, 3 cardboard floors to assemble one on each other, 4 wooden animals and one die. The aim of the game is to be the first to arrive at the top of the “pyramid”, using the ladders to go faster and avoiding the waterfalls that make the players go down. Heat transfer printing for the animals. Rules of the game in 6 languages (French, English, German, Dutch, Spanish and Italian). 2 to 4 players. To dive into the exciting universe of the firefighters with their trucks, helicopter, rescue dog,…Includes 33 pieces: 13 accessories and 1 train of 4 wagons with its 12-rail circuit. 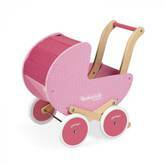 Solid wood: birchwood (train and accessories), beechwood (circuit rails). Assembly instructions included. Closed color box with plastic handle. 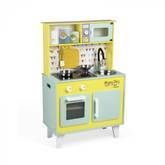 Prepare tasty little dishes for your friends, just like mom and dad, and become a Little Chef!!! Macaron Maxi cooker is made from wood and has a set of pegs for hanging 2 metal spoons, 1 metal saucepan and 2 cardboard food boxes (peas and sugar). Just like a real kitchen, it features two dials with sound effects to turn on the two induction cookers, an oven and a cupboard with magnetic doors, a stainless steel sink and a clock. Height of the worktop: 50 cm / 19.7 in. Delivered not assembled. 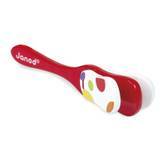 Closed colour box with plastic handle. Create 4 magnificent photo frames. To do so, you have several accessories at your disposal: flowers, bowties, leaves, glue-on foam mosaic pieces and sparkles, and embroidery sequins. Once done, simply insert your best photos and hang the frames on the wall. This activity is perfect for developing concentration and manual dexterity. Different sizes and shapes for each frame (27 x 20,5 cm / 17,5 x 21 cm / 19,5 x 19,5 cm / 15 x 15,5 cm). Contents: 4 frames, 56 cardboard parts, 48 sequins, 70 double-sided stickers, 19 diamonds, 56 round foam mosaïc stickers, 1 cotton string (2 m long), 1 needle. Possibility to hang up or lay down the frame on a furniture. Instructions leaflet in 7 languages (French, English, German, Dutch, Spanish, Italian and Russian).